WARNING: it’s much closer to a commenary and en editorial than a review. But you know me and the hell with it. Empty, empty, it’s all empty. Pointless, pointless, it’s all pointless. And yet, throw it all away and it becomes so simple. One of my complaints about the Garden of Sinners series of movies is that some details were left out. But you know, that can never be helped. I respect that. However, I honestly wished they animated the final important conversation between “Shiki” and Kuroto. It is a conversation that not so much reveals everything hidden underneath the words, the scenes, or the plots; it also doesn’t really solve everything or explains everything so clearly that everyone can understand. That’s fine; that’s what Kara no Kyoukai is suppose to be. You can understand it using your mood, your feelings and most of all, your instincts. You’d resonate with it if you were not ippanjin. That much I’m sure of. At the end of the day. Nasu, Otaku, and people like me are not ippanjin. However, and this is a personal reading into the novel and the last conversation, we all wished many times that we were. The road of the Otaku is Shurado, which roughly means an excruciatingly painful road; it’s something akin to a path to hell. Then again, perhaps I’m mentally broken in some ways and that’s why I feel this way about the novel. Maybe I’m the only person who feels that way. Anyway, once again, the movie takes some liberty with the final conversation. The “Final Chapter” explains things and make them clear to us. It’s nice that it doesn’t dumb down everything, which I nearly accused the series of, but it certainly bares more than I’d liked. One thing I really love about Kara no Kyoukai, having read the novel 5 times (and still scratches my head sometimes when I read it), is the restraint its characters show. Sometimes, it feels like a lesser academic version of an emotional and philosophical exercise, compared with Ghost in the Shell. But overall, it is intense at times while interweaving the beauty of the “acceptence of it all” into everything. I’m biased because I really relate to some of the aura it eminates, which surrounds me in the form of floating gentle snowflakes. It’s an eternal silence that makes me recall times back in the late 90’s to early 00’s when I were alone at home on New Years Eve, when it snowed. I was there but I wasn’t; I was surrounded with silence and I was inside of it all and yet outside of everything at the exact same time. Distance, solitude, with perhaps a dash of desolation. No, a lot of it. Beneath it all, there is an intense longing of not wanting to reject/deny/refuse, but after much pondering, the distance is kept. Perhaps Nasu walks even further away than I and possesses a much more mature emotion not to mention reacts in a mature way than I.
Let’s walk a little closer to the 30-minute exposition itself. It follows the silent tone of the quieter parts of the movie series closely. The animation is once again, top-notch. Things jump out at me that made me realize how much work was put in it. 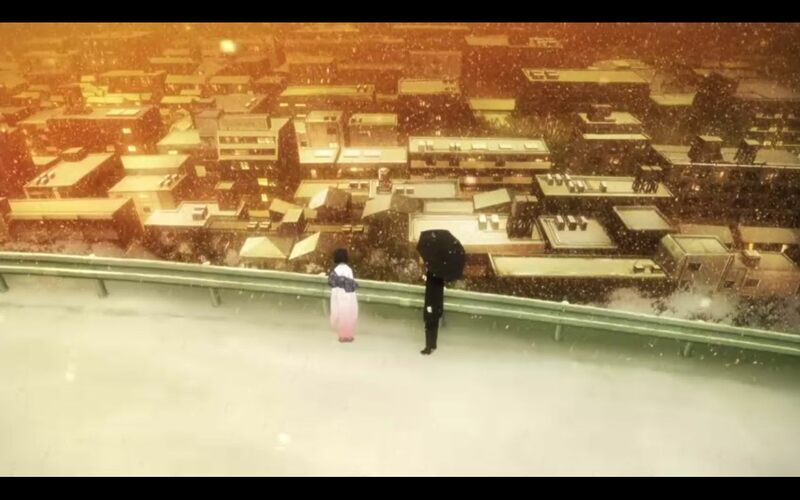 At least, the particles (pardon my novice 3D Max speak) for the snow that Shiki scrapes off as well as the float of her clothing in certain scenes must took a hell lot of work to get it right. Also, the vividness of the patterns on her kimono is fresh and lively, in a gentle contrast of the closed snowy world the Final Chapter is set in. And in strong contrast with Kuroto’s black coat and outfit. The music adds that final touch that draws you in. None of it is meant for the action-lovers so they will probably stay away. All of it is meant to take us into the core of the philosophy of the movie; the real soul inside the empty shell. And the music does a perfect job helping with that. Alas, I do have one complant. The “Final Chapter” comes to a conclusion that states that (yes, it feels that clear) living a plain, normal, eventless life is a really fortunate thing. In addition, the accepting of how people are really just empty beings inside after all is treated as the right thing to do. If I trace the logic of what I read about Nasu, it almost feels like that he cannot do a thing about his rejection/refusal of others. Not a simple dislike, as his editor noted in the official Taiwanese translate version (Yes, they got the rights and for that edition, Nasu’s editor shared his thoughts about Nasu and his work), but a decision to reject. Now, I pretty much feels the same way most of the time. But something inside screams “objection” so vehemently that I cannot simply nod and say “yes, I utterly agree”. Not when the movie states it almost as if shouting quietly in broad daylight. The problem about having an exposition made into movie is that there can be too much exposure on top of explaining it all. There is also a danger to cave in to the need to having to have an easy (relatively speaking, of course) conclusion that’s reachable to more people. I think the movies falls victim to that. By the way, feel free to object my opinion. At the end of the day, it’s probably my intellectuals pride (we’re known to exhibit the smartasshole syndrome at times) that feels strongly irritated, albeit unnecessarily. So let me go back to my normal self a little bit. Yes, I like the movies and yes, I’ve waiting for more bluray DVDs to become available either in Taiwan or the US. That means I really like this series of movies. I also think with what they modified, the movies are not as hard to get into as the novel can be. In fact, even ippanjin can appreciate the beauty and the fluid animation, not to mention the wonderful voice acting of the cast. The bottomline is the movie series is worth checking out and the DVDs/bluerays collection is worthy of a spot on your shelf of art movies, even next to your Miyazaki ones and probably best next to your Ghost in the Shell movies, but not the first one. Kara no Kyoukai movies will eventually come out in the US, I think starting February of this year (there is already a licensed Taiwanese version). Full disclosure: I bought movies one and two in Taiwan and got a poster. But I’m not in college anymore and don’t like posters, so I gave it to a brother from church; his daughter belongs to a college anime club in the poorer Taiwanese South. Strongly recommended to folks who are patient enough to wait for the magnificent reward. Previous PostFreezing 04 rulez and scares the lolicons awayNext PostEarly Report: Madoka Magika – The Flesh or The Bones? Looking forward to watching the series. Since the story is set in the 90’s, dark age, right after the bubble burst, the beginning of the long lost decades, maybe I can relate to myself as well. Japan was pretty much uniform, standardized society that didn’t appreciate non-ippanjin, probably the 90s was the worst time for otaku. Now, Japan is getting diversified, yet not as much as multicultural America. Once I watch the films, looking forward to have a discussion. Very nice animation. I do have one question. I’ve heard that she disappears, she goes over the cliff, and they go their separate ways at the end. So from your point of view, what happens? Every time I read, I always feels that she walks off and fades (disappears) into the snowy night. I read the ending literally as in she walks away; he stays and then leaves. My reason is that I feel the last conversation was created purposely to be much, much more silent than the quieter parts of the novel, to create the sense of the silent sadness of acceptance of living, specifically the living portrayed in the novel. Therefore, their parting is deceptively normal, even common place. But Kuroto shows something extraordinary in his reaction to it all. Not sure where she goes over the cliff. The movie is much more vague about their parting. Firstly, long comment is long because I don’t feel ready to write my own post just yet. Sorry about that. (: Secondly: to my shame I’ve ordered the US import box set of this. It’s expensive for sure and by the time shipping and UK customs are paid, it’ll be even more expensive! But I honestly feel it’s worth it because I appreciate these films on so many levels. I wish I were confident enough in my opinion of this segment to comment on whether I agree with you or not, but even after a second viewing I’m not sure I’ve grasped what it’s really trying to say. It’s an exercise in reading the subtitles over a really pretty background as opposed to enjoying it as a film like I did with the other seven, but even so I did pick up mixed messages from the conclusion as it stands. Whether they’re the same mixed messages you’re getting, I’m really not sure! Listening closely I noticed that Maaya’s dialogue is delivered with her more familiar bright and clear timbre instead of that lower pitched, laconic tone she used in the other movies. I’m assuming then that we’re supposed to take this to mean Shiki’s character is somewhat different…I’m guessing this is her ‘true’ self that Kokuto encountered on their very first meeting. Perhaps it’s this ambiguity that’s whipped up a bit of nerdraeg among viewers – half an hour of two people talking isn’t everyone’s cuppa after all (personally I don’t mind Nasu’s idiosyncratic writing style; and in any case, I could listen to Maaya’s voice all day). I’ve purposefully avoided reading up about what happens in the novel after the movies, but I have heard there are other events that occur after those of the seventh film, but weren’t shown in this one either (which is probably where the nerdraeg stems from, actually). My problem with it, really, is that I don’t want to think it truly ends it with the two of them walking away from one another. After all they’ve been through I’d hope that, even if loneliness is insurmountable, they can at least be lonely together! Could be wishful thinking on my part – after getting so sentimentally attached to the two of them after all this time, I want to see them attain some measure of happiness. I do get the feeling that they will, literally, “See each other tomorrow”, because the “Shiki” encountered in the epilogue is not, in a sense, the Shiki that Kuroto sees every day. She is more like a prototype without spirit but is the origin of Shiki. She is also the container for both Shikis, and so, she is, in a very literal sense, the Ryogi Shiki, the true Ryogi Shiki. There isn’t any indication that Shiki and Kuroto won’t be together. But anyway, the fun of it all is how people can interpret it differently. As usual, I recommend reading the novel and then watching the movie. Let me know when your post comes out. i’ve decided to take another route with the interpretation of the final ep. i’ve decided to take a very philosophic view of it. i think the purpose of the 3rd shiki persona appearing before mikiya is for mikiya’s benefit. notice that the beginning of the episode mikiya walks with a definite limp, he also seems to be hiding his scarred eye. we can clearly see that mikiya is burdened or shadowed… perhaps by the events that happened in the last episode. the fact that mikiya is carrying an umbrella can be construded as a metaphor too. umbrella after all comes from the latin word ‘umbra’ which means shadow. towards the end of the episode, we can see his scarred eye clearly, as if he isn’t ashamed to show his scars anymore. the wind also blows his umbrella away, and as the movie ends, we see mikiya walk away, but i notice he doesn’t seem to be dragging his other foot anymore, and he’s sporting a half-smile. as they say…there’s a decided spring to his steps as he walks back the way he came.